The Green Angels is committed to empowering families by connecting them to health and human services. We created the “Community Resource Guide – Linking People and Resources in Wayne County” in 2009 which contains information on local assistance programs available to families in need. In collaboration with over 100 local organizations and community leaders. The guide may be found in schools, libraries, village halls, food pantries, churches, doctors’ offices and more. Soon after the first edition, there was significant demand for a web-based version of the guide. To date, we have printed 46,000 copies and are on our fifth edition. 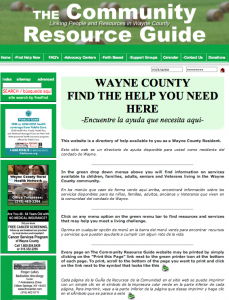 In April 2010, we launched www.WayneResourceGuide.org, which is a web-based version of the printed guide. This site is used extensively and experienced nearly 1 million hits in its first full year. Both the guide and website are available for families at no charge. Many organizations utilize these as tools in their daily routine of linking individuals with programs around Wayne County. The Green Angels believes there is a way to make the future brighter for families and their children in our area. We pride ourselves on being respectful and effective. Join with us today!